DAIMONOLOGIA: Can Demons Suffer Physical Harm? Such physical confrontations with demons are encountered in the lives of the saints, in particular the life of St. Marina the Great Martyr (July 17), in whose life we read that while she was imprisoned, the devil sought to frighten her by first taking the form of a dragon, but after she made the sign of the Cross he vanished. Then he took the form of a black dog, but Christ's athlete seized him by the hair and, finding a hammer, struck his head and back, completely humbling him. 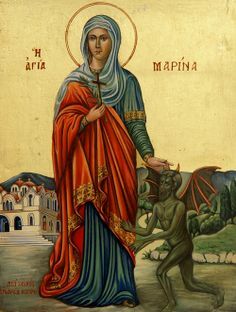 And yet another time the devil appeared and ran against the Saint as she stood in prayer, taking her into his hands, yelling and threatening to kill her if she did not stop, for her prayers troubled him. Christ's handmaiden Marina again seized him by the hairs of his head and beat him. 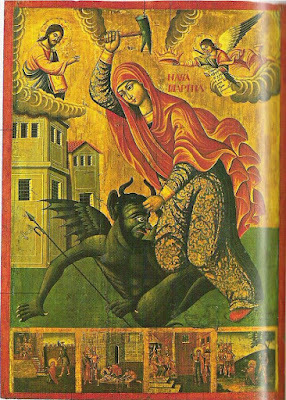 After trampling him under her feet, the young martyr courageously won the victory, and the weakened devil vanished, while the uncreated light of God illuminated the entire dungeon. 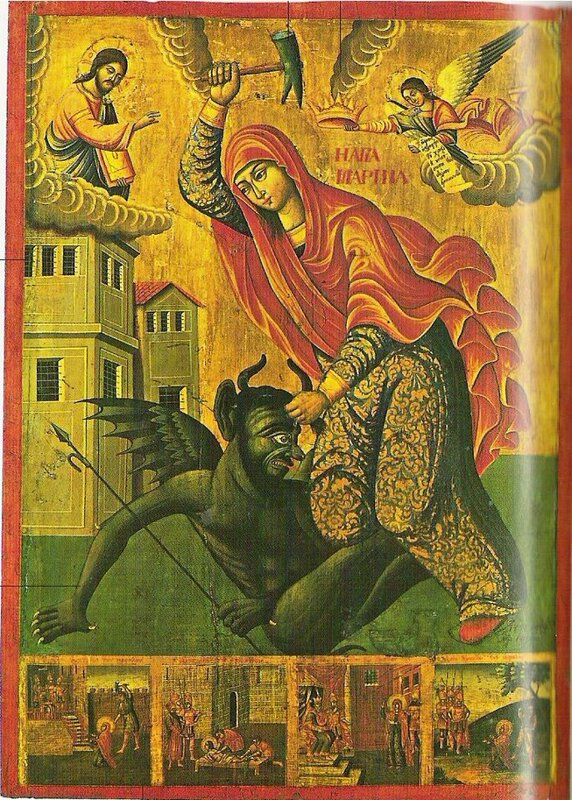 In regards the physicality of demons, St. Nikodemos the Hagiorite explains in his book Unseen Warfare: "Know also that Lucifer, first among the angels, was also of old above all foolish imagination and outside all form, color or sense – an immaterial, unsubstantial, formless and bodiless nous. But he gave rein to his imagination and filled his nous with images of being equal to God, and so fell down from this formless, imageless, passionless and simple immateriality of nous into a multi-form, complex and coarse imagination (as many theologians believe), and thus from a formless, immaterial and passionless angel became a devil, in a certain way material, multiform and subject to passion. As he became, so also did his servants – all the demons." "In accordance with this, we must suppose that those who secretly wrestle with us abide in another great world which, in its nature, is akin to the natural powers of our soul.... Thus, three princes, impinging upon the corresponding powers of the soul, wage war against it, each conducting his attacks against the particular part allotted to him. At one time they too were noetic, but having fallen away from immateriality and refinement, each one of them acquired a certain material coarseness, gaining flesh according to the level and nature of the deeds, whose practice qualified him. For since, just like man, they have lost the delights of angels (the angelic taste or the angelic heaven of delight) and have been deprived of divine bliss, so too, like ourselves, they began to find pleasure on earth, when they became material and acquired the habit of material passions. Nor should we wonder at this, since our own soul, created wise and thoughtful in the image of God, having refused to know God, has become bestial, senseless, and almost insane through delighting in material things. For habit is wont to alter nature and change its action in accordance with the direction of the will." 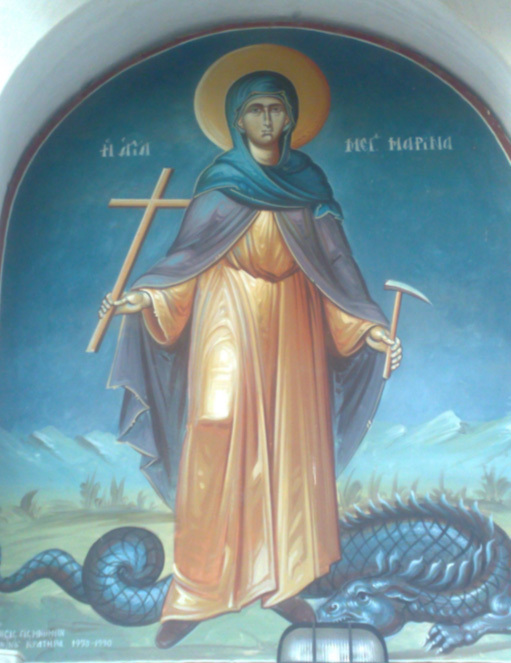 In light of this, St. Nikodemos concludes: "For this reason the holy fathers call the devil a painter, a serpent with many forms, feeding on the dust of passions, a breeder of fantasies, and other such names. The word of God represents him as incarnated into a dragon, with a tail, ribs, neck, nose, eyes, jaws, lips, skin, flesh, and other such members. Read of this in chapters 40 and 41 of the book of Job. Understand from this, beloved, that since multiform fantasy is an invention and creation of the devil, it is very welcome to him and useful in achieving our ruin. The holy fathers rightly call it a bridge, by which the murderous demons enter our soul, become mixed with it and make it a hive of drones, a dwelling place of horrible, evil and impious thoughts and of all kinds of impurities both of body and of soul." A blessed Athonite monk, Elder Augustine the Russian (1882-1965), was very virtuous, very humble and very much a combatant. Once the devil appeared in his cell as a frightening dog. With fire coming from his mouth he rushed upon the Elder to choke him, because, as the devil told him, he was being burnt by his prayers. Elder Augustine seized him and threw him against the wall and shouted: “Wicked devil, why do you war against God’s creatures?" The devil, being frightened by the unexpected reception, became invisible. 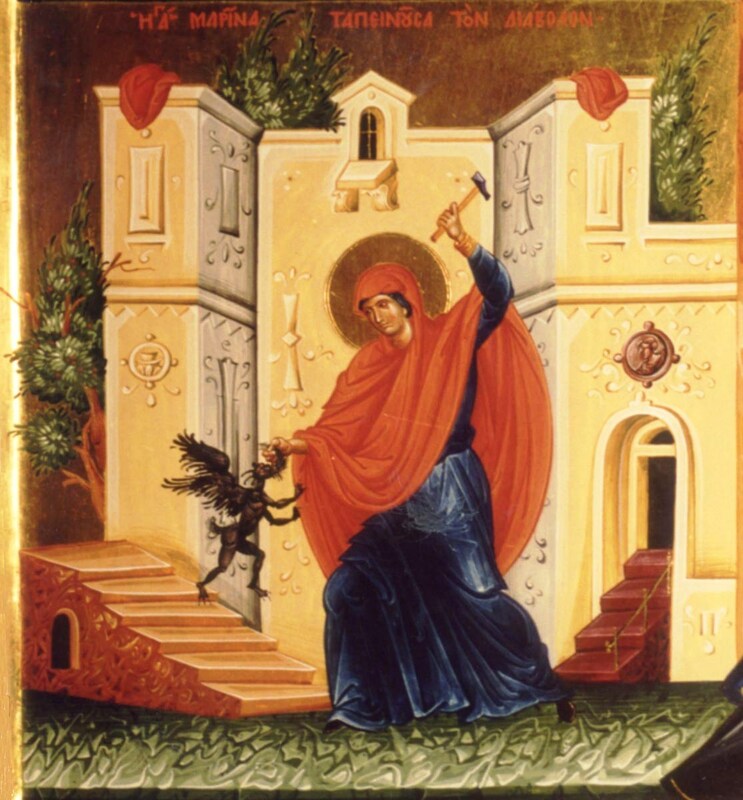 Afterwards however the most good and most simple Elder had remorse because...he assaulted the devil!